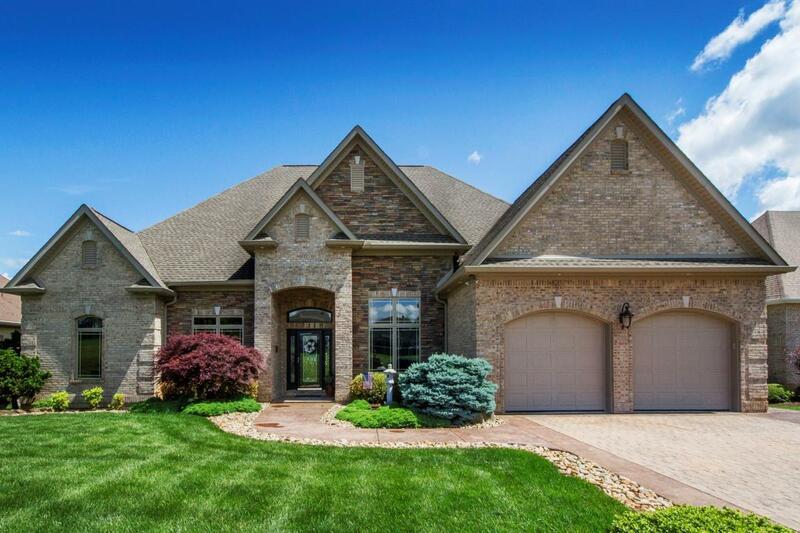 Gorgeous Golf Front Home with Fabulous Golf & Mountain Views! All Brick & Stone, Custom Built by Weaver Homes. 2,900' of One-Level Living with a Perfect, Open Layout! Kitchen w/Cherry Glazed Cabinetry, Cambria Quartz Tops & Breakfast Bar is open to Family Room w/Stone FP & Dining Nook with Wet Bar & Wine Cooler. Home Office w/Custom His & Hers Workstations & a Wall of Beautiful Vanilla Cabinetry! Gorgeous Dining Room w/Custom China Cabinet & Buffet & Triple Trey 14' Ceiling! Large Master w/Sitting Area, Huge Walk-in Shower, Long Maple Glazed Vanity! Guest Suite is 2nd Master w/Large Bath & Walk-in Shower! Rear Rooms Open to Large EAST-Facing Screen Porch & Patio. Oversized Garage w/3rd O/H Door. Tall Crawl w/Slab. Gorgeous Finishes, Perfect Size, NO Mandatory Social Membership! Hurry!